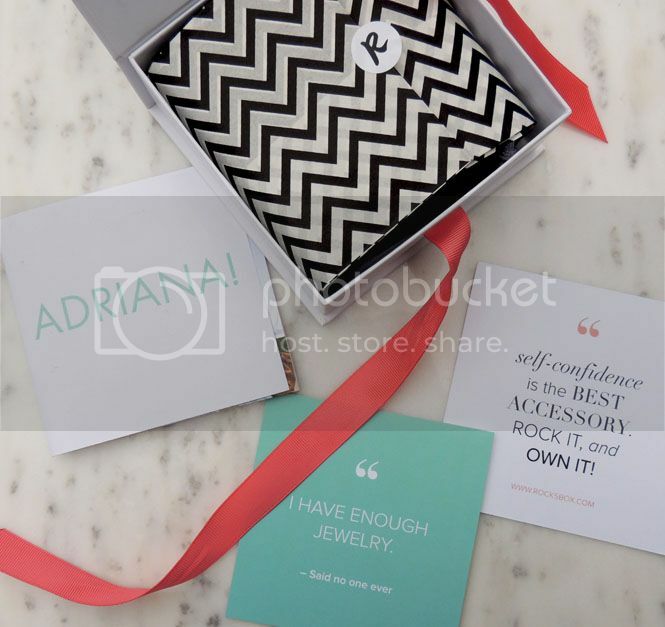 Rocksbox is different in that you don't actually automatically keep everything you get in the box; you receive three pieces of designer jewelry and essentially you can pick and choose the pieces you want. If you don't want any of the pieces you got, send them back or if you do, you can purchase them at a discounted rate offered by Rocksbox. 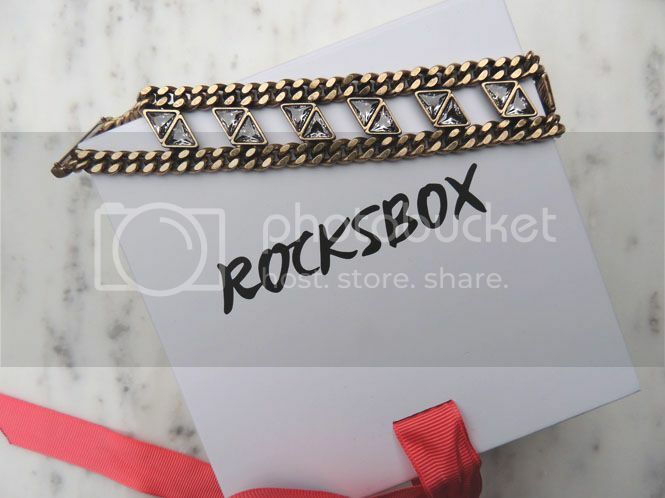 I absolutely love this idea - it isn't often that you can find designer pieces at any sort of discounted rate but with Rocksbox you can and it's a pretty awesome discount too! The monthly rate is $19 plus whatever you decide to buy - but Rocksbox was kind enough to give my readers an awesome discount - with code dailydoseofdesignxoxo you'll get your first month absolutely FREE!! So you can try it out and see if you like it and if it's for you - I took advantage of this opportunity at first and it has been so worth it - so I highly suggest doing so too! When you go to sign up, you'll be prompted to take a style quiz (who knew quizzes could be fun?!) and you'll get a stylist assigned to you to help you pick pieces that match what you like as best as possible. My favorite part about this process was selecting pieces to add to my wishlist - my next favorite part was actually receiving some of the pieces that I really had on my wishlist! Is this not the cutest box and packaging you've ever seen?! I'm so obsessed - before I even looked to see what pieces I got I was already in love! I seriously LOVE this bracelet so, so much! This wasn't on my wishlist, but I absolutely love it. I'm considering buying this piece for my mom because I think she loved it even more than me! It's so beautiful and it can be worn every day, with a dressed up outfit or even as a stackable bracelet, you know how much I looove my stackable bracelets! 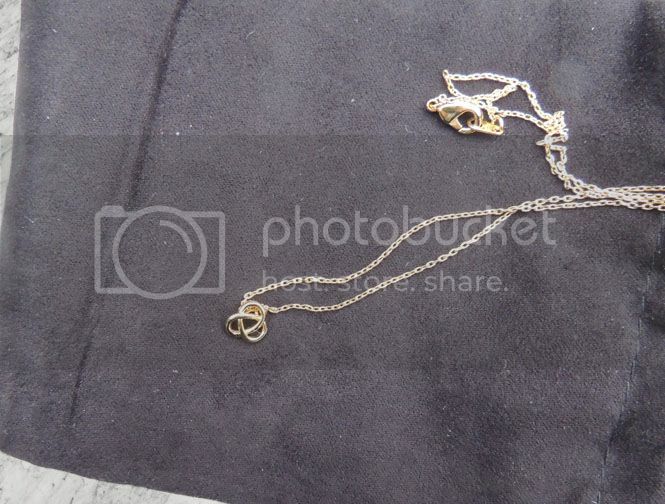 This necklace was on my wishlist and as much as I love it, I won't be keeping this piece. It looked MUCH bigger online and I'm always looking for new necklaces but it's super tiny in person and I'm not totally in love, so it'll go back - but it is super dainty and pretty. Oh my GOD, these are possibly my favorite Kendra earrings EVER!! I have a couple pairs from the Danielle line but the shape of these Skylar drops is so beautiful and the opal color is insanely gorgeous in person! No picture could do them justice, but needless to say I will most definitely be keeping these earrings! 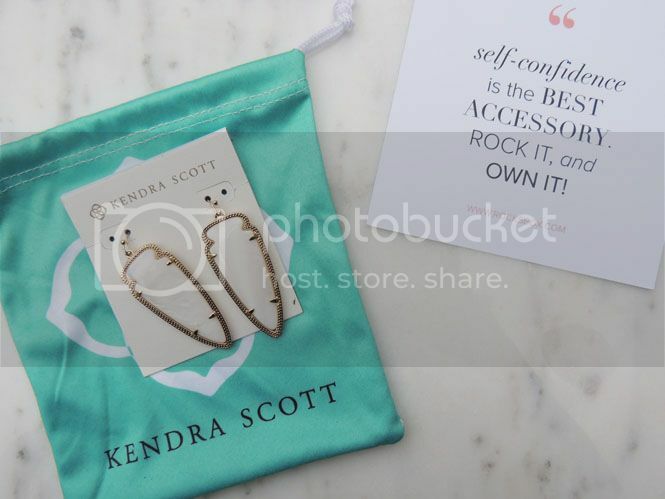 It isn't often that you find Kendra pieces (that are new anyway) on sale and the fact that I can get them with a discount through Rocksbox is the absolute best. Overall I've been SO happy with my first Rocksbox! It's one of the subscription boxes (of the many that there are) that I would 150% recommend trying. This is also a great gift idea - with Mother's Day coming up, I'm highly considering getting a subscription for my mom! I think it's a super fun idea and gives you something to be so excited for when the mail comes. 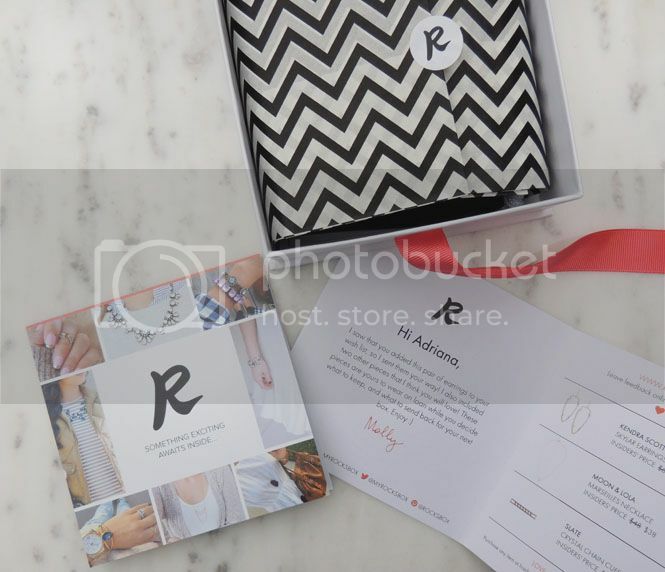 Another awesome perk about Rocksbox is that you have the potential to have FOUR different boxes per month - with free shipping both ways and the return label they send along it's super easy to switch it out weekly. That way you really are getting your moneys worth for the $19 monthly fee! The best part is - you can try this (four times!) for FREE for an entire month with my code (dailydoseofdesignxoxo). You can cancel at any time, and cancel before your next months' boxes ship too. 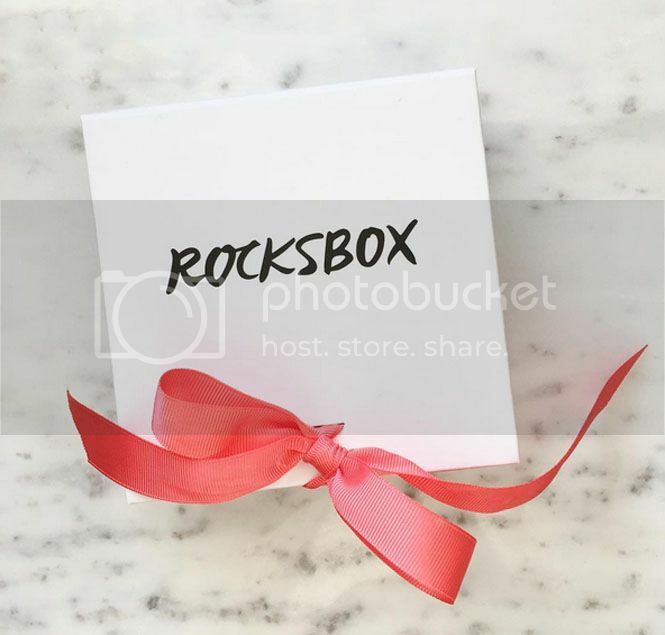 Have you tried Rocksbox before? What's your favorite piece that I got this month? Those earrings are fab!! I wasn't impressed with most of the stuff I got. Good quality but it didn't fit my stay at home mom lifestyle. Such a fun idea! And who doesn't like happy mail! Thanks for your honest review. And I do think those earrings are lovely! So fun! I'm scared to try these kinds of things because i forget to send thins back on time! They sent you some cute stuff. I love the idea of this, but wouldn't want to send anything back. I always found this box so exciting! Too bad it's not available where I am. I love your loot for this month, especially the necklace! 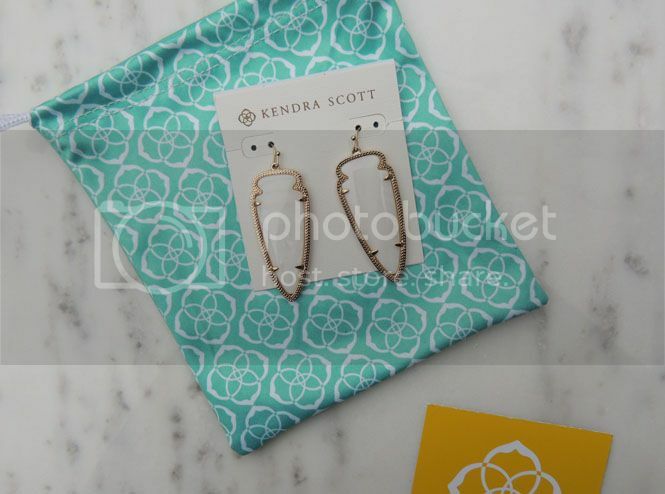 Those Kendra Scott earrings are gorgeous! I haven't tried Rocksbox yet, but it looks awesome! I am completely in love with that bracelet. Out of all the pieces that would be the one that I kept! I love this! I have been contemplating a subscription box, but I wasn't sure which one. This one looks like a great place to start. No wonder you love those earrings so much. I would have too! They are phenomenal, and that opal is incredible. Oh wow, now that's a box to get. I can't imagine anyone not loving that coming to their front door. I love those earrings, it looks really gorgeous. I didn't even know there were subscription boxes for jewelry. Thanks for sharing! I would like to try this. I love jewelry! Such a neat idea! I could see myself liking all of it! i love subscription boxes too! i was once addicted back in malaysia! love that bracelet! I love the bracelet! It would not be difficult to match that with any outfit. Thanks for the discount. I might seriously consider subscribing to Rocksbox! Subscription boxes are awesome, but this one looks amazing. what a deal! Will have to try myself. I am completely in love with that bracelet. Out of all the pieces that would be the one that I kept! Thanks for sharing. 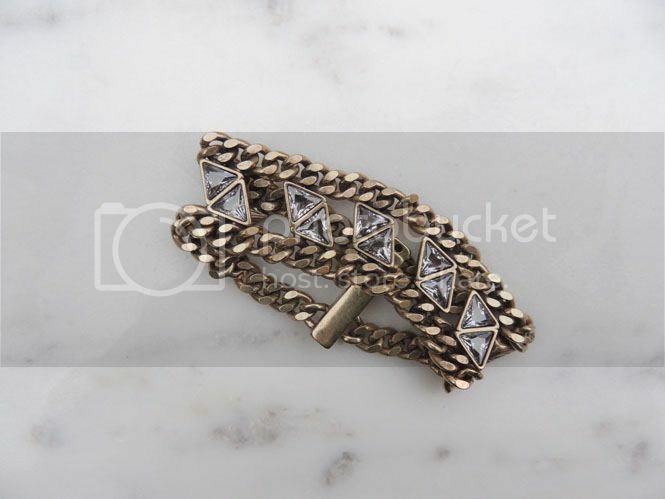 Buy Designer Jewelry Online at best price. Wow! Such a nice collection of jewellery. I really like that pair of earrings and want to buy it soon. Find the Stylish Fashion Accessories Store Sydney on Stelladion at cheap and affordable rate.